Died: 10 June 1660, at sea, near the Portuguese coast. 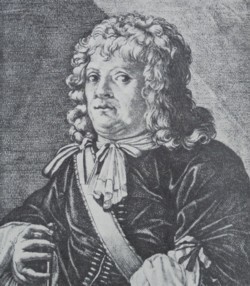 Etienne de Flacourt, official of the French East India Company (founded in 1642), travelled in Italy, the Netherlands and England, and was considered knowledgeable in medicine and chemistry. In 1648 the company appointed him as its director-general in the East and governor of Madagascar. On his way to the island he visited Saldanha Bay from 13 to 24 October. During that brief period he wrote a description of the bay and its islands, as well as the human inhabitants, animals, and particularly the sea birds he found there. Upon his arrival at Fort Dauphine, Madagascar, in December 1648 he found that the troops had mutinied, but managed to restore order. During his stay of six years the settlement was regularly harassed by the island's native inhabitants. However, he governed the island successfully, though with little assistance from the company. In 1649 he took posession also of the island Bourbon (now Reunion). He had a strong interest in ethnography and during his stay made a study of the inhabitants of Madagascar. Under his direction fruits and vegetables were collected from various parts of the island and acclimatised at the settlement, while vines were introduced in the south. However, he received little recognition for his scientific and economic work. On his return to France in 1655 Flacourt stayed at Saldanha Bay again from 7 to 26 March. He observed numerous whales in the bay, and saw signs of elephants, hippos, and other animals on shore. Of particular interest to him was a two-horned rhinoceros [he seems to have been aware only of the one-horned Indian rhinoceros]. He observed and described the animal, believing [wrongly] that it had not been described before. During the next five years he resided in France and was employed in the administration of the the French East India Company. He wrote the first comprehensive book about Madagascar, titled Histoire de la grande isle Madagascar (1658). A large part of the book was devoted to his ethnological observations, but he also described the geography and natural history of the island, based on detailed and reliable observations. English translations of those parts dealing with southern Africa appear in Strangman (1936) and Raven-Hart (1967 and 1971). The second edition of the book (1661) contained a map and illustrations of plants and animals, including 18 small illustrations of a variety of birds, fish and mammals (among them the rhinoceros) seen at Saldanha Bay. These 18 illustrations are reproduced in Rookmaaker (1989, pp. 13-14). Flacourt also published a dictionary of the language of Madagascar, which included some words used by the Khoi at Saldanha Bay: Dictionnaire de la langue de Madagascar, avec quelques mots du langage des sauveges de la baie de Saldagne, au Cap de Bonne-Esperance (Paris, 1658). However, this work has been described as incomplete and containing many errors. In 1660 he was again appointed the company's director-general in the East. He sailed from France in May that year, but was killed when his ship exploded during an attack by pirates off the Portuguese coast. A thorny, shrubby tree of Madagascar was named after him by the botanist l'Heritier. Michaud, J.Fr. Biographie Universelle, ancienne et moderne. Graz: Akademische Druck und Verlagsanstalt, 1966-1970.